The two Maine senators react to the president's remarks about Christine Blasey Ford, who has accused Supreme Court nominee Brett Kavanaugh of sexual assault when they were in high school. Both U.S. senators from Maine condemned remarks made Tuesday night by President Trump in which he mocked Christine Blasey Ford, who has accused Supreme Court nominee Brett Kavanaugh of sexually assaulting her 36 years ago. Speaking to supporters at a rally in Mississippi, Trump questioned Ford’s allegations that only days before he called credible. Collins, who was walking into a committee room, stopped briefly to answer. “The president’s comments were just plain wrong,” Collins said before entering the room. “To turn her testimony into a political rally punchline … I think ‘appalling’ is an appropriate term,” King said. 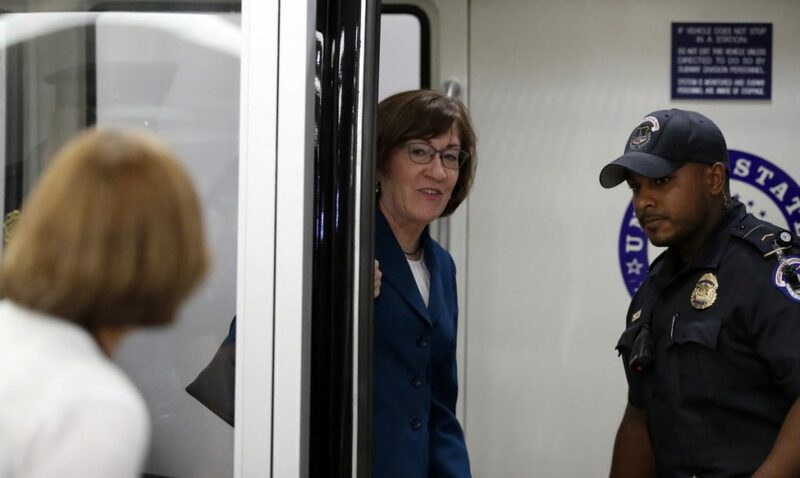 After Collins entered the committee room, the corridors outside her office were cleared by Capitol Police and media were being kept away, apparently because of security concerns, according to CNN reporter Manu Raju, who retweeted a photo of the vacant hallway that was sent out by CBS News reporter Alan He. Collins said last month that she and her staff had been subjected to hostile, vulgar and obscene comments from constituents during the intense campaign to influence her vote on Kavanaugh, including at least one threat against a staff member that would be turned over to police. Collins’ office did not immediately respond to requests for comment Wednesday about Capitol Police blocking access to corridors outside her office. Kavanaugh’s confirmation vote could take place late this week or on the weekend, depending on the results of an FBI investigation into Ford’s claims and other allegations. But many Republicans, Trump included, have steadfastly stood by Kavanaugh and continue to question and discredit his accusers. Although House members do not vote on Kavanaugh, Maine U.S. Rep. Chellie Pingree, D-1st District, also weighed in to condemn the president’s statements on Twitter.